Bring along your paintings or drawings to share. Learn and improve from other artists. It’s a fun and informal evening. Bring your own paints and have a go! Every year we have a special evening just for ourselves. The theme is to work in groups and produce a picture together. It’s a fun evening so come along and see what happens! £2 for members and £5 for non members. Here’s a couple of pictures from our Nanpantan Painting Group. It’s an informal painting session where you can join in with the still life or you can bring along your own pieces to work on. Each week is different and it’s also a great social occasion and a chance to share tips and opinions on each others art work. We are still looking for more people to come and join us, if you do want to come along here are the details, it will be great to see you! Nanpantan Painting Group, Sports ground Bowls Club, Nanpantan, Loughborough 1st and 3rd Monday of every month 7pm-9pm. £3 for members. Charnwood Drawing and Painting Club launches into 2019 with a cracking programme of events. It all starts on Tuesday 22nd January with a mixed media demonstration by renowned artist Sonia Bacchus. Club Chair, David Chaplin, says interest in painting and drawing is flourishing in Charnwood with new paint and draw sessions and quality art demonstrations throughout 2019 tempting in new members. 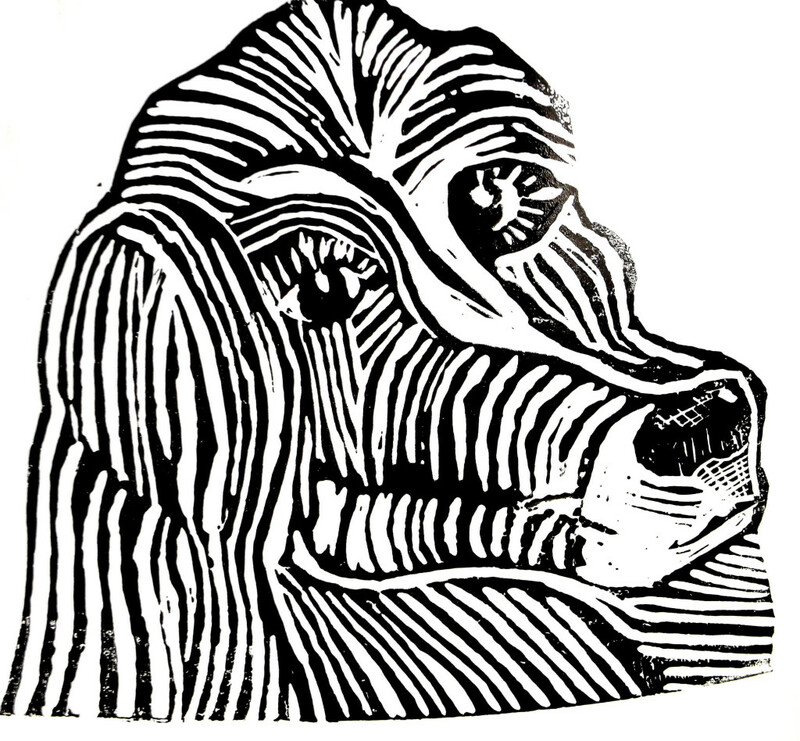 Sonia Bacchus has been a professional artist since 2000 and has visited Loughborough before. We warmly welcome her back, says David. Sonia studied art in her home town in Poland and was ‘spotted’ by a film company, who employed her to create many famous film drops. Her demonstration this month however is about making ‘moving’ pictures from still life, using a mixed media presentation. Exciting stuff. 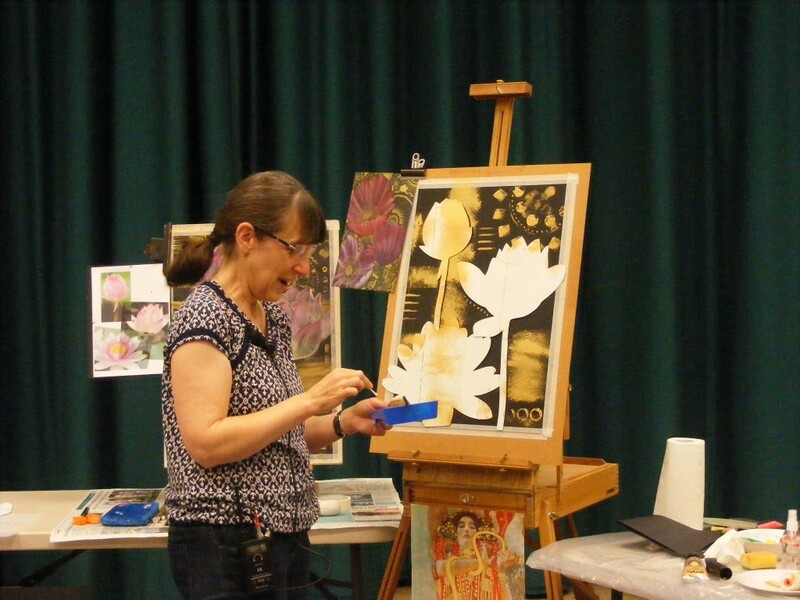 Charnwood Drawing and Painting hold regular demonstrations in Loughborough on the fourth Tuesday of the month from 7 to 9pm at Woodbrook Vale School, Grasmere Road, Loughborough, LE11 2ST. A small entry fee applies but refreshments and free parking free parking are provided. Members and visitors are warmly welcome and reserving places is highly recommended. Phone enquiries to David Chaplin on Tel 01509 230366. Further details about the club’s art programme including future demonstrations, exhibitions and art sessions can be seen on www.charnwooddrawingpainting.com. If we thought that painting in abstract was a walk in the park, Chris Tkacz’s presentation on March 27th made everything clear. Or did it? Painting landscapes in the style of abstract expressionism was the theme for the presentation which kept us spellbound for two intriguing hours, with lots of questions and healthy banter – the sign of a good night! Chris hails from Matlock and now runs the Little London Gallery Studio following a highly successful career in academia where he studied at The Birmingham School of Art and Design. This led to him teaching art in Leicestershire and becoming head of art and design at a leading grammar school. Through the evening John applied vast amounts of high-pigment wet colour to create his own mixes on the paper itself all applied with flair and confidence– he paints with an enthusiasm that inspired everyone on this evening. Thanks Chris for an outstanding evening – and do come back soon! Our thanks to everyone and especially Tim Rose who braved the bitterly cold conditions on 27th February to get to our second demonstration of 2018. Tim again wowed us with his consummate water colour skills creating a remarkable street scene in Sheffield his home town in just 90 minutes. True genius! Tim has the unique ability to bring street scenes to life and in this case capturing a mixture architecture of traditional and new architecture in stunning detail whilst talking through his subject with humour and helpful tips as his artwork came to life in front of us. He worked from a detailed pencil sketch in a dynamic style painting boldly and loosely to get things started. 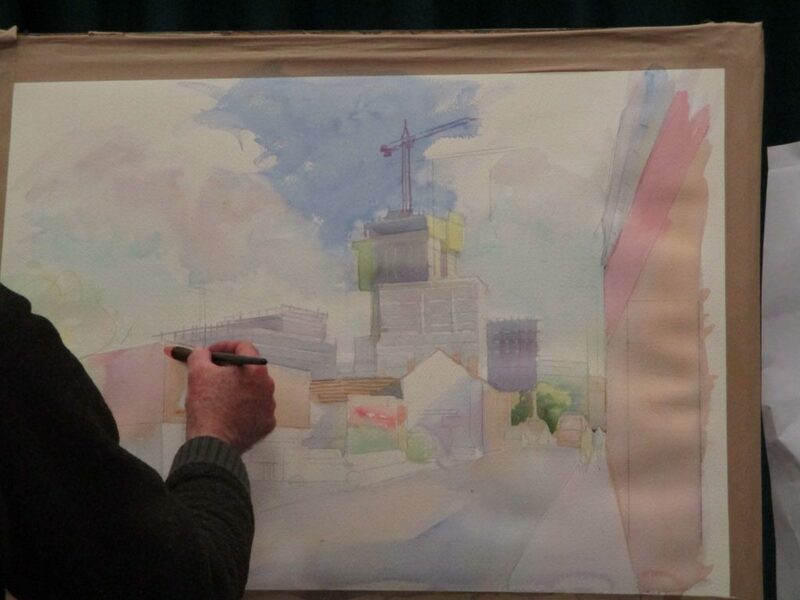 Using his favoured un- stretched Saunders paper and Winsor and Newton paints, Tim quickly established the skyline first configuring the shadows and then applying base colours to get the perfect tone. Things then took shape with cranes, industrial units and even his favourite pub coming into view. Tim normally paints city scenes ‘al fresco’ using a photographer’s tripod and working with a palette of both cool and warm colours. He said “Street scenes are pictures of human life” demonstrating this case by adding people in the picture last together with trees to soften the view. His tips included looking at where the light was coming from and appreciating the contrasts that light created. Altogether this was yet again an inspiring evening and in spite of the cold we all went away with a warm feeling and lots of ideas for the future. Well done Tim! Author adminPosted on March 2, 2018 Categories DemonstrationsTags architecture, painting, Tim RoseLeave a comment on Tim Rose returns! We get out and about visiting interesting locations to sketch and paint along the way. Here are some recent pictures of one of our adventures! May 2nd New Walk gallery – 30 Arts Council works titled “Night in the Museum”. Aug 1st Stoneywell National Trust, need to book in advance and pay entrance fee, parking on car park and coach provided to house by NT please let me know a week in advance so I can confirm parking etc. On Tuesday night we enjoyed the welcome return of Charles Evans, a professional artist and demonstrator from the North East of England. Painting in his preferred medium, Windsor & Newton acrylics. We watched him create a woodland landscape and, after a short break, a beach scene from his beloved Northumbria. Charles has the unique ability to paint, talk and entertain whilst simultaneously delivering advice and very useful tips on all manner of painting topics. The two paintings showed us two vastly different representations of skies: The landscape with a pleasing sunlit summer sky; the beach scene with its dark foreboding storm cloud. Both were painted in a similar way to demonstrate how colour choice can make a huge difference to a painted scene. Charles also showed us how a restricted palette of 8 or 9 colours can help maintain colour harmony and save cost, as any other colour can be mixed from those few colours. He gave us many other pieces of advice during the demonstration including using wet and dry acrylic palettes and a tip on restricting blue within a painting. Stick to one blue he recommended using the same colour in both the sky and in the green mixes, again in order to maintain harmony within the work. For Charles this is invariably Cobalt Blue. Altogether it was a very interesting demonstration by a master of his craft as well as being a very entertaining evening. Thank you Charles! Author adminPosted on March 6, 2017 March 6, 2017 Categories DemonstrationsTags acrylic, CHarles Evans, demonstration, paintingLeave a comment on Charles Evans Returns! The interesting demo by Sue Faulks on the 27/09/2016 it was very well received. I feel we all need to stretch our artistic endeavours, so we will be following Sue’s lead next Monday evening at Barrow’s Bishop Beveridge Club. I’ve very cheekily included three of my own works from last month to show we are not all fixated by one medium. My first ever Lino cut, first go at Pointillism and a sketch from the towers of La Rochelle while on holiday. 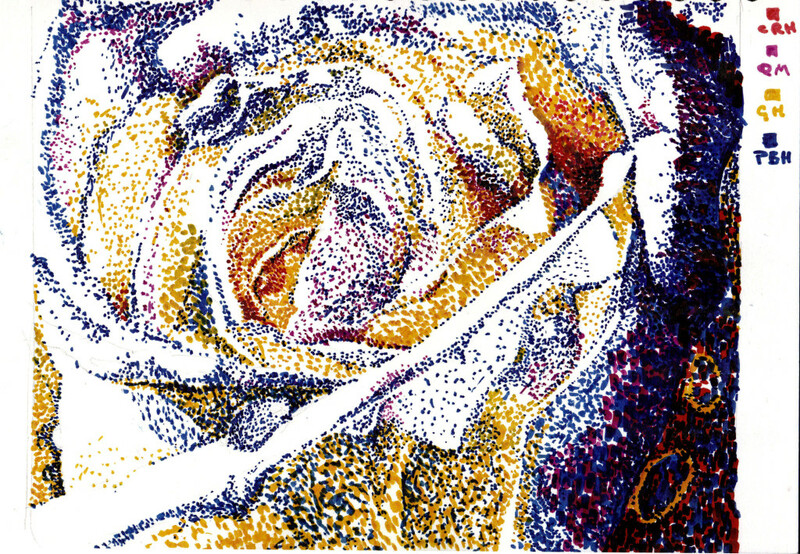 I found, only by using them for it, that Winsor and Newton Watercolour markers were great for pointillism!